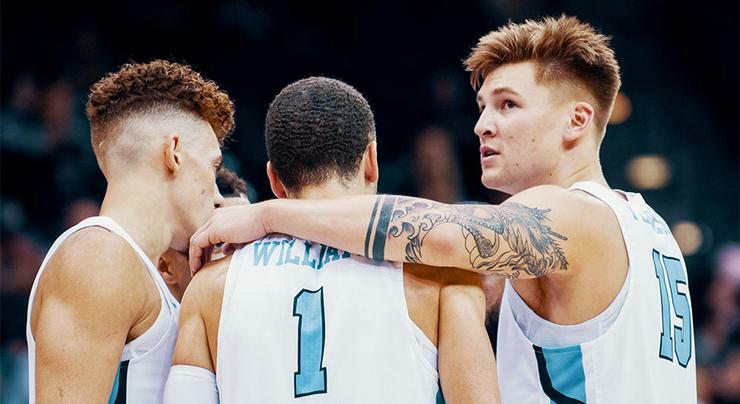 In a season of many highs already, the University of San Diego men’s basketball program, the team earned a signature West Coast Conference win with a major comeback against visiting University of San Francisco on Jan. 26 to cap off a solid week. The Toreros, still missing its second-leading scorer Olin Carter III due to an abdomen injury — he’s now missed USD’s last four WCC games — rallied from a 14-point deficit in the first half and they were down 11 at halftime to pull out a 67-63 win over the Dons at Jenny Craig Pavilion on Catholic Schools Night. USD outscored USF 46-31 in the second half. Saturday’s win, coupled with USD’s 71-58 triumph Jan. 24 at home against Loyola Marymount, a game in which USD’s Seats for Soldiers promotion provided a significant cheering boost from the Marines in attendance, improved USD’s season record to 15-7 overall, 4-3 in WCC play. Against USF, which fell to 17-4 overall and 5-2 in the WCC, Isaiah Pineiro was one of three Toreros to score in double figures with 22 points and also getting a double-double with 13 rebounds. Isaiah Wright, playing his third WCC game since his return from a wrist injury, had 17 points. Yauhen Massalski added 13 points and six rebounds. The win came on Catholic Schools Night, a promotion in which students from all 49 K-12 schools within the Catholic Diocese of San Diego were invited to attend the USD-USF game. In addition to the game, students and parents were able to attend a college-planning workshop hosted by USD’s Undergraduate Admissions Office, younger kids enjoyed a bounce house, caricature drawings and face painting in Eagan Plaza and some students participated in a high-five line when the USD team was introduced. Teachers who were USD alumni in local Diocese schools were treated to a pre-game reception. In the win against LMU, Tyler Williams scored 14 points to lead the way. Williams was one of four Toreros to reach double-digits in scoring. Pineiro had 13 points, while Joey Calcaterra and Massalski chipped in 12 apiece. Williams did most of his damage from long-range, going 4-of-8 from behind the arc and contributing over half of the Toreros 3-pointers against LMU. The balanced offensive effort featured 17 assists on 23 made baskets. Wright had six assists, followed by Calcaterra with five and Williams with four. The Toreros fed off the increased energy from more than 400 current military members in attendance. The group came to life in the second half of the game and led chants on every possession. USD shot 52 percent from the field and outscored the Lions, 40-28, in the second half. Next Game: USD at Gonzaga, Saturday, 5 p.m., Spokane, Wash. The women’s basketball team hosted the West Coast Conference’s top team in the standings, nationally ranked No. 25 BYU, on Jan. 26 in the Toreros’ lone game of the week. The result was a 65-56 loss to the Cougars (now 9-0 in WCC play), but the Toreros, using only seven players, played competitively throughout in a game that marked the halfway point of the WCC regular-season schedule. USD’s record, now 8-12 overall, 1-8 in WCC play, got a double-double performance from Madison Pollock with 12 points and 12 rebounds (11 on defense) as well as four assists and two blocks. Sydney Shepard also scored 12 points, making all of them on four 3-pointers. Patricia Brossmann and Leticia Soares each had eight points and Sydney Hunter had seven points, four rebounds and two steals. Next Games: USD at Pepperdine, Thursday, 7 p.m., Malibu, Calif.; USD at Loyola Marymount, Saturday, 2 p.m., Los Angeles. The men’s tennis team went to Los Angeles and the UCLA campus to play in a pair of matches. The end result was a split, a 4-0 Toreros victory over Ole Miss on Jan. 25 and then a 4-1 loss to the seventh-ranked Bruins on Jan. 26. USD’s overall record this season is now at 2-1. Against Ole Miss, USD captured the doubles point with Gui Osorio and Nico Borter getting a 6-1 triumph against Filip Kraljevic and Tim Sandkaulen and Guus Koevermans and David Norfeldt clinching it with a 6-2 win over Jan Soren Hain and Simon Junk. In singles play, USD was paced by Joel Gamerov’s win at No. 4, Koevermans won at the No. 5 spot and Osorio closed out the team win with a hard-earned victory at No. 1. Losing to UCLA was tough — the Bruins eliminated USD in a second-round NCAA Tournament match last year — but the Toreros put up a strong fight, especially in the early going. USD won the doubles point on match wins by the team of Gamerov and August Holmgren and then Koevermans and Norfeldt won a 7-6 (8-6) match for the 1-0 lead. UCLA, however, swept USD in singles action, getting wins at the Nos. 5, 1, 2 and 3 positions. Next Matches: USD at Oregon, Friday, 5 p.m., Eugene, Ore.; USD at Portland (WCC Opener), Sunday, 10 a.m., Portland, Ore. The women’s tennis team opens it spring match season this week when it travels to face USC for a 5 p.m. match on Thursday, followed by an 11 a.m. match against host Long Beach State on Saturday. … The women’s swimming and diving team has a dual meet this Saturday, Feb. 2 against host UC San Diego. The meet starts at noon. … The USD Baseball program’s annual For the Love of the Game event will take place on Saturday, Feb. 9, 6 p.m., at The Dana on Mission Bay. This year’s event will celebrate the 1970s. Tickets are $150 each and $125 for baseball alumni members. For more information or to register, please contact the Office of Athletics Development at (619) 260-5917. The University of San Diego men's basketball team rallied from a large first-half deficit to defeat University of San Francisco, 67-63, in a big WCC game on Jan. 26.